When I see a strong interest in a “Top 10” or “Top 25” list of Boolean search strings, it becomes clear to me that a disconnect can exist between wanting something that solves a problem (a search string to find candidates) and the ability to create something that solves a problem. While there is undoubtedly value in a list of pre-constructed search strings, specifically Internet queries designed to target event/conference attendee lists, employee directories, resumes, press releases, patents, white papers, etc., the real “magic” of information retrieval does not lie in Boolean operators and query modifiers. The real “magic” and work of sourcing talent is via human capital data is the iterative, intelligent, and cognitively challenging process of selecting a combination of words and phrases, and in some cases strategically excluding others, analyzing the results returned, making changes to the query based on observed relevance, and repeating the process until an acceptable quantity of highly qualified and well-matched candidates are identified. When people ask me for a specific search string, they may not realize it, but in effect, they are asking for the answer to a problem. In some respects, a specific search string can be compared to the answer to a specific math problem or riddle. Unfortunately, once you change the facts, figures and variables of the problem or riddle, the answer will also change. Similarly – if you change anything about your hiring need, the most effective queries to find qualified candidates will also change, and rarely are two hiring needs are perfectly identical in every way. When I started my career in recruiting, perhaps I was fortunate to not have anyone to give me any “answers” (search strings), because I had to figure out how to find top talent in our 80,000 resume Lotus Notes database on my own. Throughout my career, sourcing candidates has never been about the searches themselves, but rather the process of finding the best candidates. Going back to my math analogy, once you’ve mastered calculus, you can solve any calculus problem. Similarly, once you master the process of sourcing, you can solve any hiring problem. And I do mean any. If you are interested in leveraging information systems for talent discovery and identification, you should be more concerned with learning the “why” and “how” of good talent sourcing practices and processes, and less so in specific search strings. Rather than (or at least in addition to) asking for a search string, ask the person providing the search string how and why they specifically arrived upon the search they’re providing you. Take a fish from someone and you are fed for a day. Learn how to fish and you are fed for a lifetime. When I start the process of finding people who are likely to be well-matched to a client need, the first thing I do is research. I don’t have the luxury of always looking for the same skillset or identical hiring profiles, so even when I am sourcing candidates for a skillset that I am familiar with, there is often something that makes each hiring need at least slightly different than anything I’ve ever searched for. As such, I always spend some time investigating the skills, terminology, and companies that will likely be useful to me in finding the right people. It’s quite common for me to get requests from clients for things I am completely unfamiliar with – here are a few examples from over the years: DRSN, 3PL, CTR, Cockburn Use Case Analysis, 10-K’s, LTL, SOP 97-2, SAB 101, MRS/PS. I’ve learned to not be intimidated by any request, because if the people exist, I can find them. Nothing a little research won’t fix to get me spun up quickly. On the other side of the investigative coin, human capital data/information isn’t uniform, consistent or complete. Two companies with the same role can and often do give the role different titles. Skills, responsibilities, technologies, and even some company names can be written and expressed in a wide variety of ways – ensuring that it’s impossible for a single search string to retrieve every potentially qualified candidate. Furthermore, there are people who either simply forget to include or consciously exclude explicit mention of some skills, responsibilities and technologies. If you need a QA test engineer with experience testing applications developed in PHP, you can’t find people who do have that specific experience, but who didn’t think it was critical to mention that the applications they tested were developed in PHP. It happens all the time – the Dark Matter of human capital data is insidious and significant – most people don’t know what they’re missing…literally! Investigative research can help uncover all of the various ways that skills, responsibilities, technologies, and company names can be written and expressed, discover what companies have certain types of employees, roles, and technologies, as well as help identify what skills, experience, responsibilities and technologies people may easily forget to include in their resume or social media profile. “Iteration” means the act of repeating a process, usually with the aim of approaching a desired goal or target or result. Each repetition of the process is also called an “iteration,” and the results of one iteration are used as the starting point for the next iteration. “Incremental” is defined as relating to, being, or occurring in especially small increments. For those of you who source and recruit in the software development space, you are likely familiar with Iterative and Incremental development as the heart of a cyclic software development process that starts with an initial planning effort and ends with deployment with the cyclic interactions in between. Iterative and incremental development are essential parts of the Rational Unified Process, Extreme Programming and generally the various agile software development frameworks. You can easily adapt this process to electronic talent discovery and identification. Once a hiring need is identified, the required skills, experience and qualifications are identified and an initial query is generated and executed. Once the query has been run, the results are analyzed for relevance and for further information that may be useful to incorporate into successive searches. Based on the observed results, the initial query is modified appropriately (more terms are added, some may be removed or excluded, term weighting and proximity may be applied if the search engine supports them, etc. ), the search is executed, and the cycle repeats until the results are deemed acceptable in terms of relevance (high percentage of results of people who are highly probable to be qualified for and interested in the opportunity). A sound candidate sourcing process is iterative and incremental – it involves repeating the cycle of (1) search, (2) analyze the relevance and quantity of search results, (3) modify the query slightly (incrementally) based on results analysis (4) search until a search is settled upon that returns a decent quantity of relevant results – people who are highly likely to be qualified and interested in the opportunity being sourced for. For some hiring profiles, the initial process can take less than 5 minutes. For others, it may take up to 30 minutes or more. The iterative and incremental sourcing process follows the plan-do-check-act (PDCA) cycle of business process improvement. 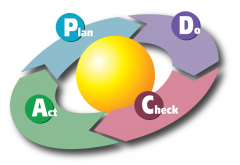 PDCA (plan–do–check–act) is an iterative four-step problem-solving process typically used in business process improvement. 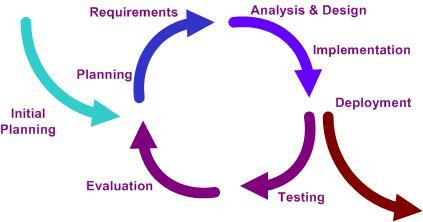 It is also known as the Deming circle/cycle/wheel, Shewhart cycle, control circle/cycle, or plan–do–study–act (PDSA). PDCA is a successive cycle which starts off small to test potential effects on processes, but then gradually leads to larger and more targeted change. PLAN: Based upon hiring requirements gathered, establish an initial query that is likely to identify people with the expected skills, responsibilities, experience and qualifications necessary. By making the expected output the focus, it differs from other techniques in that the completeness and accuracy of the job/hiring specifications are also part of the improvement. CHECK: Analyze the relevance and quantity of the results from the query and compare the results against the hiring profile and requirements to ascertain any differences/variance. ACT: Analyze the differences between observed results and the hiring profile to determine their cause. Variances can be part of either one or more of the P-D-C-A steps. Determine where to apply changes that will include improvement. When a pass through these four steps does not result in the need to improve the search string/query, process and review the search results completely while keeping an eye out for information or patterns in the results that could help you further refine your query to identify more potentially qualified candidates. When it comes to human capital information retrieval, the sourcing process is more important than the search strings themselves. There is no “final answer” or single search string for any given hiring profile – some of you may be surprised to learn that I am never “done” with any particular search. I can and often do revisit searches I have constructed in the past and continually improve upon them, as I’ve found that you can never stop learning from and observing patterns in search results that you can incrementally incorporate into your successive queries to make them more effective. Perhaps sourcing, whether as a separate role or as a function of the recruiting role, may get more respect, attention, and investment when proven and well documented cyclical software development and business process improvement methodologies are adapted and applied to the talent sourcing process.